I am warning you, there is an overload of photos in this post!!! Five in Ten Designs is an awesome little concept- it's an eBook which comes with one basic block, it's a bodice for volume no.1 and then you have 5 amazing indie pattern designers create 10 different looks from that one basic block. This is a great book to teach and show you how to modify and alter the basic bodice to give ten entirely different looks. It also fun because it gives you the possibilities of creating your own style from the basic block as well. The possibilities are endless. I decided to go with look no.4- a sweet little dress with full skirt and peter pan collar. I switched the cap sleeves with some 3/4 sleeves instead, with autumn right around the corner I just new MissE would get more use out of her new little dress. This dress screamed vintage to me and I just knew I wanted to give it that retro feel as much as I could. The dress is all made from recycled and thrifted materials. I recently thrifted the striped fabric, I think it might have been a table cloth before- it's seems to be a cotton & poly mix. The collar is a from a white linen shirt and I added a little vintage lace trim around the collar. The buttons are all mix matched, I know I went over board but I like it! Finally, I sewed on this little lace appliqué I've had forever. I added some khaki fabric to add a little punch of colour and some contrast. I took the pockets pattern from look no.5 and added them to my look. Which is another great feature in the Five in Ten Designs eBook, not only do you have 10 lovely styles to try, but then you can play around and create many more! I am very pleased with the end result. It helps when the patterns are easy to put together, when the instructions are easy to follow and clear and when the designs are simply awesome. I have my eyes on a few more designs in this book, I just love the ruffle top as well as the cute round pocket dress. Little MissE would love it if I made her a princess dress for Halloween, what little girl wouldn't?! You can have a look at all the styles on the Five in Ten Designs website and purchase it there too. I must thank Heidi from Elegance & Elephants for providing me with the book in exchange for a review. She is one of the 5 talented designers, these ladies came up with one fun concept and I can't wait to see what vol.2 will bring. A pant block would be amazing! Just saying!!! I really wish I had a diner near my house, I would have loved to take the photos in a 50's style environment. I could just picture MissE sipping on a milkshake in a turquoise pleather booth or perhaps dancing the twist with her friends all night long! I paired the dress with a vintage vera scarf, some vintage crocheted socks and some pink converse. I have a fear of making buttonholes. However, I found a way of making them on my embroidery machine at work- I am a happy woman! Thank you all for passing by my little blog and I wish you all an A-W-E-S-O-M-E weekend!!! 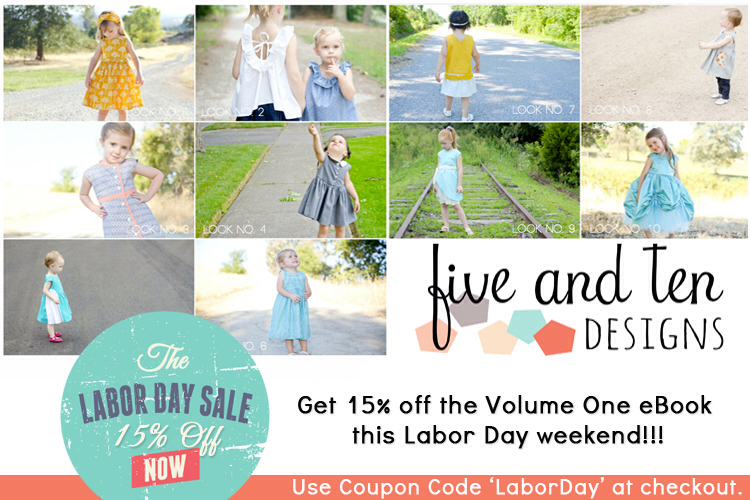 Don't forget to check out the Five and Ten Designs website! **** Updtae: the pattern eBook just went on sale! get 15% discount with coupon code LABORDAY- hurry the sale end Setemoer 2nd at midnight.